Ford Motor Company runs Warriors in Pink, a program they say is “dedicated to helping those touched by breast cancer.” But the exhaust from Ford’s vehicles increases breast cancer risk. This hypocrisy is called pinkwashing. Astonishingly, earlier this year Ford announced they will almost exclusively sell SUVs and trucks in the U.S.—vehicles with higher cancer-causing emissions—and will stop selling their only 100 percent electric, zero emission vehicle and nearly all other passenger cars. If Estée Lauder is really serious about their self-proclaimed mission “to create a breast cancer-free world,” they will put their marketing, mere awareness, and positive platitudes aside. They will stop pinkwashing and take meaningful action that makes a difference to all women, from all communities who are at risk of and living with breast cancer. Tell Estée Lauder to stop the betrayal. Bee Sweet Citrus and Wonderful Citrus, the U.S.’s largest citrus grower and the company behind Halos® mandarins, are using leftover wastewater from oil corporations to irrigate their citrus—while also using pink ribbons to sell them. We call this pinkwashing. As this type of food irrigation is set to expand, we believe this is an urgent public health issue because of the potentially hazardous chemicals associated with all oil extraction processes. At least one test of oil wastewater used for food irrigation found that it contained the chemical benzene, a known human carcinogen linked to breast cancer. Tell these agricultural corporations to stop pinkwashing and stop watering our food with oil wastewater. Look Good, Feel Better is a program run by the Personal Care Products Council and the American Cancer Society; they hold free workshops that give beauty tips and complimentary makeup kits to women in cancer treatment—support that some women understandably value while facing a cancer diagnosis. The downside? Many of the products offered to women in Look Good, Feel Better make-up kits contain chemicals linked to increased cancer risk and some of the chemicals may actually interfere with breast cancer treatment. Demand these multi-million dollar industry giants stop pinkwashing and start protecting women’s health. Breast Cancer Action’s 2014 Think Before You Pink® campaign was a direct call to STOP THE DISTRACTION of pink ribbon marketing and culture. We are calling attention to the countless ways the breast cancer industry, and the culture of pink it has spawned, distract attention away from the bold action we need to successfully address and end the breast cancer epidemic and to achieve health justice for all women in all communities. 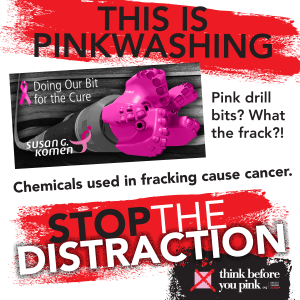 For 12 years, Breast Cancer Action’s Think Before You Pink® campaign has held corporations accountable for their toxic pink ribbon products. In 2013, instead of targeting pinkwashers one at a time, we went straight to the source—the chemicals in these products that are making us sick in the first place. In 2012 during the election cycle we asked our elected leaders, and those running for office, to step up to end the breast cancer epidemic by publicly supporting the 2012 Breast Cancer Action Mandate for Government Action. In 2011, our Think Before You Pink® campaign targeted a perfume called Promise Me, a perfume commissioned by the giant of the breast cancer movement, Susan G. Komen for the Cure. Promise Me contained chemicals not listed in the ingredients that: (a) are regulated as toxic and hazardous, (b) have not been adequately evaluated for human safety, and (c) have demonstrated negative health effects. 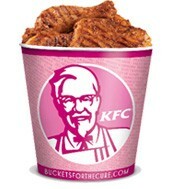 In 2010, Think Before You Pink® focused on “Buckets for the Cure,” a partnership between Kentucky Fried Chicken and Susan G. Komen for the Cure. 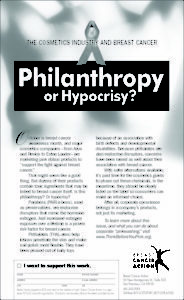 In 2009-2010, following on the success of our “Put a Lid On it” campaign (see below), we continued to put pressure on the sole manufacturer of rBGH, Eli Lilly. In 2008, Think Before You Pink® focused on Yoplait’s pink-lidded yogurt, which was sold to raise money for breast cancer, but was made with dairy stimulated with the hormone rBGH. Together we pressured 2/3 of the U.S. dairy market to go rbGH-free. In 2007, we focused on car manufacturers who sell cars to raise money for breast cancer, while the cars themselves produce air pollutants linked to breast cancer. 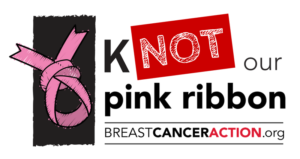 In 2005 and 2006, BCA went back to the basics of the problems of cause marketing, with an online flash file urging people to ask critical questions about products being marketed with a pink ribbon. In 2004, the Think Before You Pink® campaign focused on the inefficiency of funding breast cancer research by buying pink ribbon products. 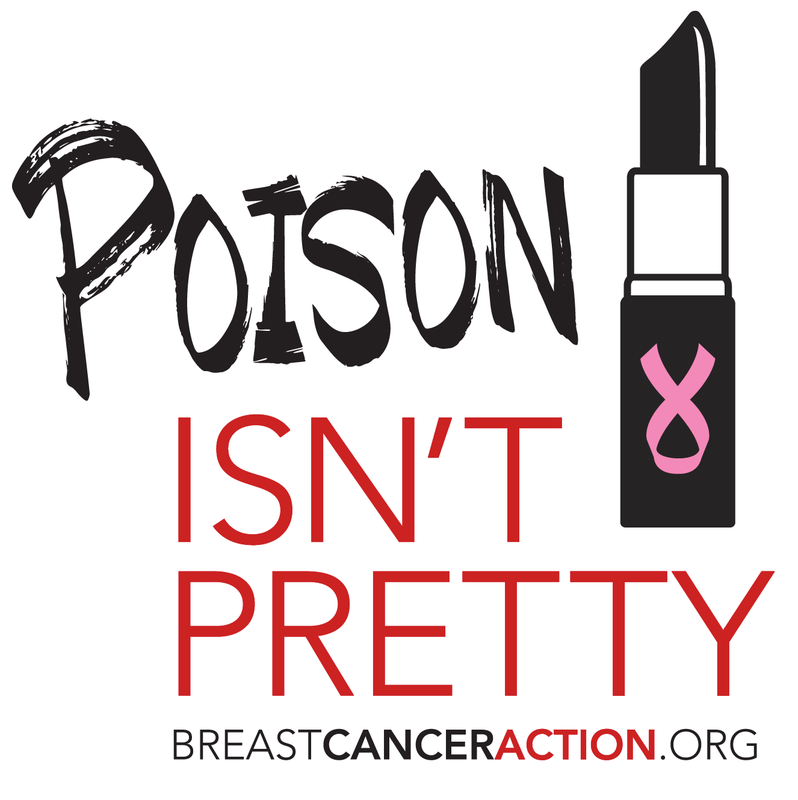 In 2003, BCA coined the term “pinkwasher;” we focused on cosmetics companies that raise money in the name of breast cancer, but manufacture body care products with known carcinogens or reproductive toxins. 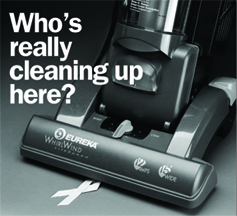 In 2002, we formally launched the Think Before You Pink® campaign. 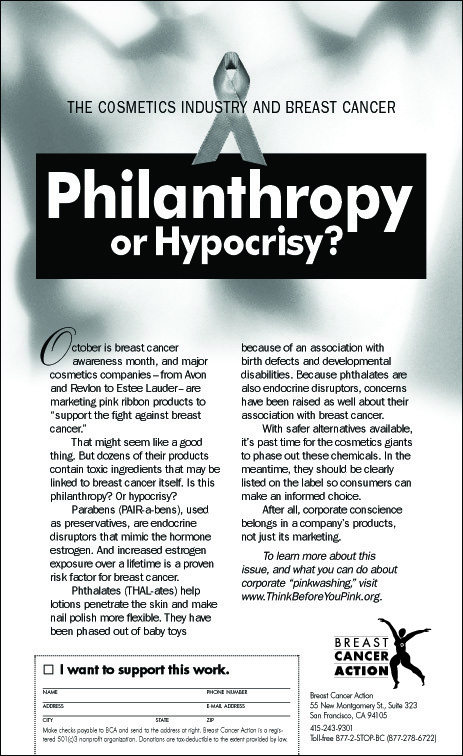 We developed thinkbeforeyoupink.org, highlighting critical questions that consumers should ask about pink ribbon products.